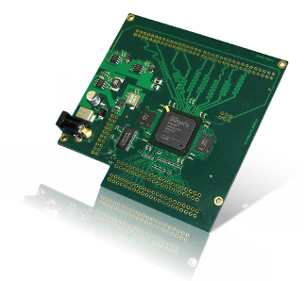 The SP6_Vision board is a highly customizable extension board which can be connected to the APF27_Dev or APF51_Dev board and dedicated to signal processing. The board is composed of a large Spartan6 Xilinx FPGA (LX45 to LX150) and two independent mobile DDR memories. Only a single power supply is required. The communication with the i.MX processor is done through the first FPGA located on the APFxx. Download of the firmware on the SP6_VISION is done in by using parallel bus in order to reduce the programming time. Sample code and the download tools are provided by armadeus.